I am a 58 year young guy, whom has always wanted to swim well, and consequently decided to take lessons. Swimming freestyle (front crawl), I become tired very quickly, and have been advised my leg action is excessive and that effort is tiring me, the result my arm stoke becomes quicker and more erratic. Is there any routines I can complete to help slow my leg action. Congratulations on learning how to swim and being able to swim freestyle. My suggestion would be to buy yourself a pull buoy that you can put in between your legs (thighs) and then swim freestyle. 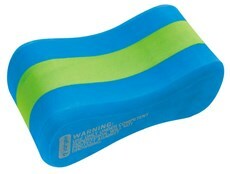 The pull buoy will help keep your legs afloat and will mean that you need to do long hard strokes with your arms. This will stop you from using your legs in swimming. A second option, that may sound a bit weird, is to put on some fins and swim freestyle with your legs kicking with fins on. Kick slowly and use your kick more for balance than forward propulsion while your focus on good technique with your arms. You can gradually kick a little bit harder and work on getting a nice timing between your arms and legs. It is not unusual for swimmers to be more dominate with their legs than their arms. It is just a matter of slowing the kick down and working harder in the upper body. Incidentally, the fast kicking you are currently doing will be lifting your heart rate quickly because you are using some of the largest muscles in your body, hence why you are getting tired quickly.